I am not a natural runner. I am slow and clumsy. I'm sure that I don't look very graceful and I know that I will never win a race. I sometimes get frustrated when I see other women out running, especially who are around my age, and they are literally sprinting the entire time while I feel like I am barely shuffling my feet. I really didn't start running on a consistent basis until I joined the Army in 1999. Of course, I had to run during basic and AIT. I had to run in OCS but it wasn't until my Officer Basic Course that I chose to run. I ran mainly for the fitness factor, and of course because of the inevitable PT test, but there were little spurts where I almost enjoyed running thrown in here and there. Given the fact that I had never been taught the "right" way to run, I'm sure that you will be surprised to find out that my first race was a full marathon. Yep, 26.2 miles. In the mountains. In Arizona. I entered into The Thunder Mountain Marathon in Sierra Vista, Arizona just 9 months after breaking my fibula in the Army. The race was on March 27 and I didn't start training for it until January 1. Crazy. What was I thinking?? In my mind, though, I kept telling myself that if Oprah could run a marathon at 40 then I certainly could run one at 27. The difference was that Oprah had trainers and nutritionists and trained for several months. Although I did finish that race (and even placed 3rd in my age group), it made me hate running. I swore that I would never run again. Fast forward a few years and I found myself training for a half-marathon. This time, though, I was smarter about it. I gave myself plenty of training time and downloaded a schedule for first-time half-marathoners. I made it all the way to the 10 mile training mark and then I re-injured the same foot that I had broken in the Army and had to have surgery. "That's it," I told myself. "I am just not meant to be a runner. I hated the marathon and clearly couldn't finish training for the half." I went through several months of crutches and strengthening my foot. I joined a gym and took classes, lifted weights, and did the eliptical. One day I said, "I guess I'll just try the treadmill for a bit." Wouldn't you know it? I ran 2 miles right off the bat. Then, 3 miles and then 4. I developed a stress fracture in the same old Army foot. "I am DONE running," I told Scott. "I guess I'm just not meant to be a runner." "Uh-huh," he said to me. So, what happened next . . . this Spring as soon as it got nice, you got it, back to running. This time, though, I have only ran in a couple of 5K's and haven't committed to anything longer than that. I really want to do the St. Louis Inaugural Rock-n-Roll marathon (the half) but with my track record, I am afraid to sign up for it and then not be able to do it. I can tell you that I really do not like to run and that is not a lie. What I DO like, though, is how I feel when I am done with the run. I'm not talking about the "runner's high" that you hear about. I'm talking about how proud I feel of myself that I actually did it. I get the same feeling if I just run 2 miles or 5 miles. I just feel proud of myself that even though I can't run fast, I don't breathe right, and I'm sure that I have horrible posture, at least I did it. I saw this posted on one of the blogs (I can't for the life of me figure out who it was--comment and let me know if it was you!!) and I loved it. How motivating is that? 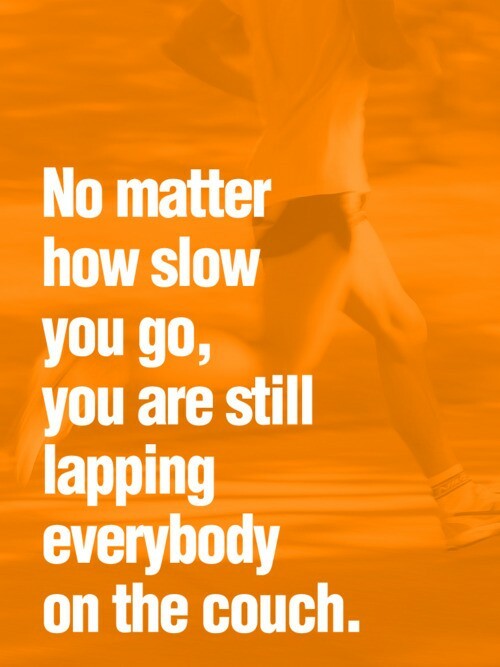 I think I'm just going to repeat this to myself the next time I'm running a 11+ minute mile. let me tell you like SO many have told me...if you RUN, you are a RUNNER!!! it's that simple! Although you've had obstacles to overcome, you ARE a runner! I'm like you, I love that feeling I get after the run...such a feeling of accomplishment and knowing that I pushed myself! It's a great feeling. Wow! good topic are discussed in this blog , Good picture gallery is added for support in this blog. Keep it up ! Best wishes for the future. I love it. I am also "not a runner". I struggled and struggled for years to "become" a runner, quitting many times, saying "I guess I'm just not..."
But, I enjoy running (most of the time- we're kind of having a fight right now... but I always go back). I'm a new follower from Fitness Friday! Have a great weekend! Great post! I am just hopping over from the bloghop and am now a new follower! I am with Marissa, if you run, then you are a runner. Keep up the hard work! I used that same quote on my blog a few weeks ago and it literally is what keeps me going! i think you are doing great, you run and in my mind, that means runner!! You are totally a runner! If you run...and especially if you get a good feeling (mental or physical) from it, I say keep doing it. Just be careful! I love that quote. I saw that on someone's blog but I can't remember who either! Very inspiring! Keep it up!